Information about the widespread decline of pollinators has been well known for some time. Recent studies documenting steep reductions in insect populations worldwide are new, however, and of great concern. One study, published in late 2017 in the journal Biological Conservation, cited a 40 percent decline in insects worldwide. Insects are the base of the food chain, providing food to many of our favorite birds and mammals. California is experiencing especially severe shortfalls in its insect populations: Among the most threatened are moths, butterflies, and pollinators. There are many contributing factors, but the main one is loss of habitat. Urbanization and the conversion of undeveloped land to industrial agriculture leaves bees and other insects without native plants for food and space to build nests. A study by the University of Vermont found that wild bee populations in the United States declined by 23 percent in just five years, between 2008 and 2013. Other factors decimating insect populations are herbicides, fungicides, and pesticides. The Netherlands is trying to reverse this alarming trend, with Amsterdam leading the way. Its municipal government has created a sustainability fund to improve the environment, not only for bees but for entire ecosystems. Since 2000, the diversity of bee species in the city has increased by 45 percent â€” 21 species of which had not previously been documented in the city. What strategies are the Dutch trying? They are transforming planting strips, parkways, parks, road meridians, and vacant land to native plants, especially ones that have lots of flowers and fruit for bees. Four years ago, Amsterdam set a goal to convert 50 percent of all public green space to native habitat. It has also banned the use of chemical pesticides on all public land. Developers are being encouraged to install green roofs on new buildings, again with native plants attractive to wildlife. One six-story hotel has turned its green roof into a tourist amenity, with hammocks for lounging and a dining room with large windows overlooking the roof garden and the city. Visitors linger and get absorbed in the views. Homeowners are offered subsidies to change existing roofs and walls to native vegetation. Residents are also allowed to remove a 16-inch strip of pavement against their houses in order to plant native grasses and shrubs beneficial to bees, butterflies, and birds. 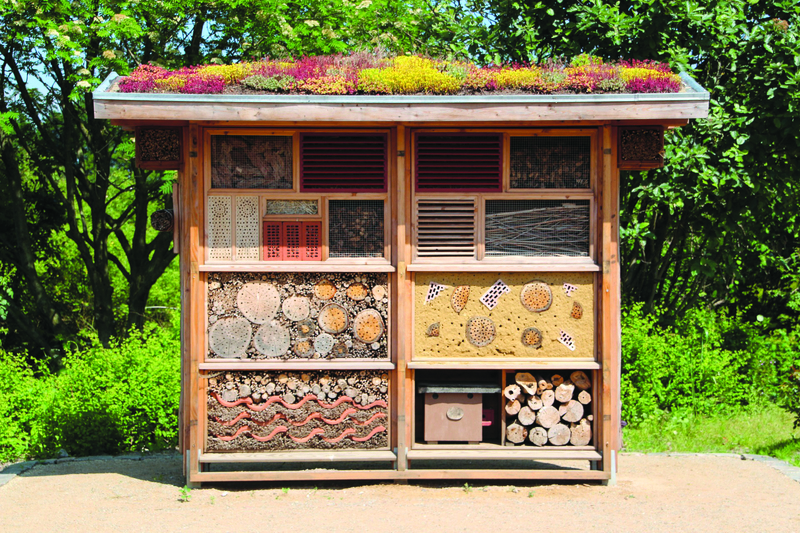 The city has even installed what it is calling â€œinsect hotels,â€ small chucks of wood with holes drilled in them to invite bees and bugs to nest. This patchwork of planted strips, parks, and roofs has the added benefit of lowering temperatures in the city, sequestering carbon, and providing pollinators for city gardens and urban farms. As a beekeeper, I dream of how much more we could be doing here in Santa Barbara to encourage bee, insect, bat, and bird populations.